Oral health is connected to the knowledge, motivation and level of oral hygiene of each individual. The strict conduct of oral-hygiene care is essential to maintaining good dental health. Aim: The study aims to implement three methods for oral hygiene training and to assess their effectiveness. The study covers 60 children aged 4-12 years. The children were divided into three groups depending on the method of training: I Method using motivational materials and audiovisual materials; II Method – education in the group; III Method – individual education. The assessment of the oral-hygiene status was accomplished by the simplified oral hygiene index-Greene & Vermillion. 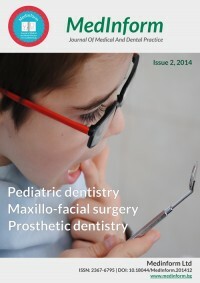 The reported results were compared to a control group of children, who continued their traditional oral-hygiene practice.Results and conclusions: In both the experimental and control groups, prior to the training, oral hygiene was found inadequate. The results showed improvement in oral hygiene to be the most significant in children with individual training, followed by the group trained with motivational materials and children educated in a group. The oral hygiene status of the participants in the control group remains unsatisfactory at the end of the study.